The Maryland law firm of Richin & Gaines, P.A., provides quality legal guidance and knowledgeable counsel to individuals who were hurt due to the negligence or reckless actions of another person. They are dedicated to the pursuit of justice for Silver Spring clients and those throughout the Washington, D.C., metro area. This law firm takes cases pertaining to a variety of personal injury needs, including products liability and medical malpractice cases. Their goal is to fight for reasonable and fair compensation for people who suffered needlessly. They know the law, and they employ their years of experience to build strong cases on behalf of every person who turns to them after an accident or injury. Every attorney at this law office strives to obtain restitution that represents the past losses of the client as well as his or her future needs. They work hard to pursue fair settlements through negotiations, but they are not intimidated when the circumstances call for litigation. Protecting the best interests of the client is their goal above all else. 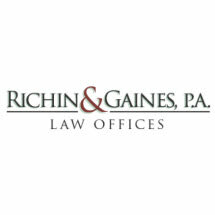 The law firm of Richin & Gaines, P.A., is proud to offer free initial case evaluations. If you were hurt, you can learn more about your legal options by reaching out to schedule your meeting with an experienced member of this team.